Instructions: Click here to view a larger photo of this project. 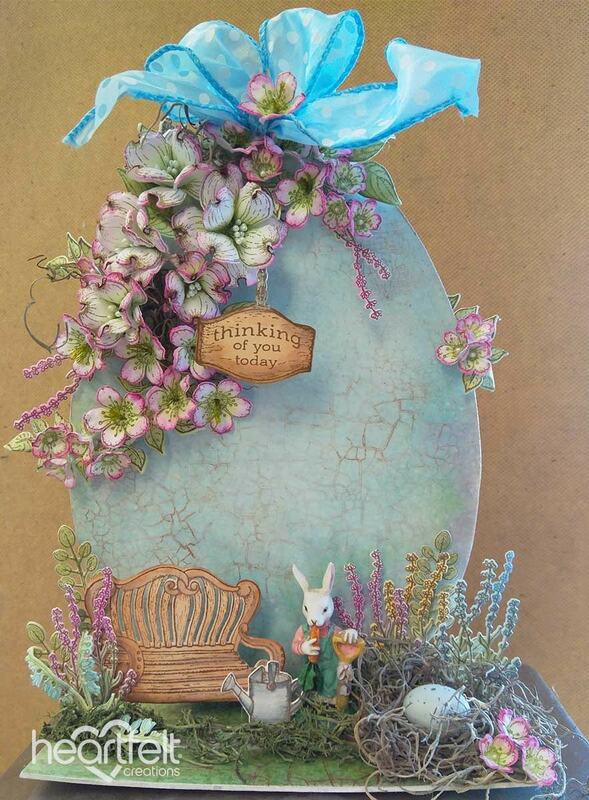 Cut an egg shape out of cardboard about 9" high, cover the back with cream cardstock and cover the front with paper from the paper collection. Cut cardboard for the base, 7 x 4" and cover with designer paper. Cut 2 pieces of 1 x 5", 2 pieces of 7/8 x 5" and 2 pieces of 3/4 x 5". Make 2 piles of these sets and glue them on top of each other with the backs lined up so you have 2 stair shapes. Take your egg and place it in the center of the bottom plate and then you glue the stairs on both sides of the egg so that the egg is standing in the center. Cut and adhere designer paper on top of the stairs.Now take the Crackle #1 and cover the whole egg and bottom and stairs, let that dry for 30 minutes. Then take Crackle #2 and put this on top of the Crackle #1. Let this dry 30 minutes or longer, then you start to see the cracks coming in. When it's dry take a piece of cloth and your Nuvo Embellishment Mousse, put a little bit on the cloth and smear it in the cracks on the whole project! Stamp the bench on white cardstock with Rich Cocoa ink, color with Coffee ink and die cut. Place the little wooden block on the back and glue it on the left of the egg. Stamp the watering can with Rich Cocoa ink on white cardstock. Color this very lightly with a brush marker and the Jet Black ink. Die cut it and glue it on the right side of the bench. Glue the Rabbit next to that with hot glue. Make a nest with the moss and hot glue an egg in it, place it in the corner. Stamp the vines from the Cherry Blossom Retreat collection, and the Dogwood leaves with Bamboo Leaves ink on white cardstock and color them with Bamboo Leaves and New Sprout ink and die cut. Glue 1 on the left side on the egg and 1 on the back of the right side so that it sticks out. Stamp all the Flowers with Bamboo Leaves ink on white cardstock, color the centers with New Sprout ink and die cut. 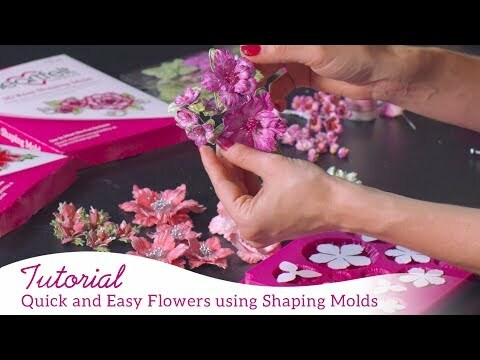 Ink the edges of the Flowers with Vibrant Fuchsia ink, then shape the dogwoods using your Deluxe Flower Shaping Kit. Glue 2 on top of each other, then make a hole in the center and insert stamens. Place the Cherry Blossom Flowers in the 3D mold, spray lightly with water, put a lid on and run them through your machine. Make a hole in the center and place some DMC in the center like a stamen. Make a nice arrangement on the left side of the egg, adding moss as needed. Add small flowers on base and right side of egg. Stamp some backyard blossom accents, Lily of the Valley and vase fillers with Rich Cocoa ink and Bamboo Leaves ink, on white cardstock and color them with Vibrant Fuchsia, French Ultramarine, Buttercup inks and die cut. Glue them behind the bench, bird nest, and in the floral arrangement. Stamp the sign with Rich Cocoa ink on white cardstock and die cut. Color it with Coffee ink and hang it in the flower arrangement.